An anti-corruption group, Socio-Economic Rights and Accountability Project; civil society groups and the opposition parties under the aegis of the Coalition of United Political Parties have called on President Muhammadu Buhari to order a probe into the spending of military budgets from 1999 to 2018. They also called on the President to take before the International Criminal Court all cases of alleged diversion of military funds, including $2bn arms funds allegedly diverted during the administration of former President Goodluck Jonathan. Their call followed the attack on the Metele military base in Borno State by terrorists. The terrorists, believed to be fighters of the Islamic State West African Province, had attacked the army base on November 18, during which scores of soldiers, including a commander and his assistant, were reportedly killed by the insurgents while others fled the base or were abducted. The army had yet to release any figure of missing or deceased soldiers a week after. In an open letter on Sunday by its Senior Legal Adviser, Bamisope Adeyanju, SERAP said it believed the inability of the Nigerian troops to respond adequately to attacks by insurgents was tied to inadequate arms. It said, “We believe that referral of the cases to the ICC would serve as a deterrent and ensure that Nigerians, particularly those in the North-East of the country whose human rights, including the right to life, to human dignity, and to an adequate standard of living have been violated, are not denied justice and effective remedies. It added, “The military's inability to respond adequately to the Boko Haram insurgency suggests among other things mismanagement in the spending of the country's defence budgets. Also, Transparency International and the Campaign for Democracy have asked the Federal Government to investigate the huge funds voted for military arms and ammunition, particularly for the anti-insurgency war in the North-East. They said the huge amount budgeted for the military to prosecute the war had yet to yield any positive result. TI said on Sunday the escalating terror attacks on military bases showed there was a “huge defence corruption” in the system that needed to be urgently looked into. He said, “The resurrection of attacks by the insurgents in the country is a very sad and unfortunate development. This is at a time when the government had repeatedly informed the whole world that the terrorists had been technically defeated. Secondly, it is so unfortunate that the huge amounts of resources to procure ammunition and motivate the troops have not yielded many results, if any. Also, the CD President, Usman Abdul, said the civil society had repeatedly been against the extension of tenures of the service chiefs by the President, saying there was much corruption in the military. He said, “What is happening in the North-East is sad and it is part of the official corruption in this administration that led to such failures. The mass killings of our soldiers by terrorists are unwarranted. Large chunks of money were released for military arms and ammunition; but the money is unaccounted for. “Today, the money meant for armaments was doled out by the government, but the soldiers meant to defend the territorial sovereignty of the country are falling dead every day due to poor weapons. “This is why the civil society groups have repeatedly been against the extension of tenures of the service chiefs by the President. In its reaction, the Coalition of United Political Parties said in a statement by its spokesman, Ikenga Ugochinyere, that it regretted that the incident happened on the same day some service chiefs attended a political function organised by the ruling All Progressives Congress at the Presidential Villa, Abuja. Ugochinyere said it was obvious the service chiefs were out of communication and beyond the reach of their subordinates and certainly could not give instructions and coordinate backup and air support for the troops who were left to die. He described the increase in attacks by the Boko Haram and ISWAP on military facilities in the North-East as a national embarrassment. Ugochinyere called for the immediate sacking of the service chiefs. He said, “From the attack in Jili in July where we reportedly lost over 200 soldiers to Zari in August, Mainok and Kekeno and now Metele, this is one attack too many. “This is a national disgrace, especially with the loud mouthing of an outgoing regime which had claimed the group was degraded and technically defeated after alleged misappropriation of billions of dollars. “CUPP is shocked also by the dishonourable silence of the Federal Government on the attacks which only became prominent on the social media after the terrorist group released very gory videos of some of these attacks. “For President Buhari to only summon service chiefs for a briefing five days after such a calamity clearly shows the slow response time of this administration to national emergencies and the lack of capacity to meet up with the fast pace of developments which affect the lives of citizens. Ugochinyere alleged that heads of security agencies in Nigeria had become more interested in obtaining intelligence on the meetings of opposition leaders than on the activities of Boko Haram. He added, “The police and State Security Services are now more interested in hounding and intimidating opposition leaders and activists than they are in identifying and neutralising the activities of the terrorist group. “Boko Haram is now allegedly expanding their territory even beyond the territories they held in 2014 before they were pushed back just before the 2015 general elections. It described as appalling and sacrilegious that months after President Buhari received $1bn to fight Boko Haram, videos supposedly released by soldiers on the front suggest that the soldiers were armed with obsolete weapons. “We don't want to believe yet the allegations that security chiefs with the knowledge of their political masters have now turned this war into a source for raising campaign funds. “The political ambition of the President and indeed any other person is not worth the lives of Nigerians. This ugly trend must stop and it must stop now,” CUPP added. Meanwhile, some soldiers fighting Boko Haram insurgency in the North-East have rejected the alleged approval by the Chief of Army Staff, Lt. Gen. Tukur Buratai for the promotion of soldiers who unraveled the circumstances surrounding the disappearance and subsequent death of the former Chief of Administration of the Army, Major General Idris Alkali (retd). They said on Sunday they were dissatisfied that despite what they had suffered in fighting the war, they were not being recognised. They described the army chief directive in favour of the soldiers sent to Jos for the special task as an insult to them, when they had been in the bush for years without recognition by their superiors. Some of the soldiers in the North-East, who spoke to journalists on condition of anonymity, said, “The Chief of Army Staff promoted soldiers that went for the search operation of the body of Major General Alkali in Jos but neglected the soldiers in the North-East, whose lives are in danger and dying every day. “This is unfair and it will further demoralise us. What death or danger have the soldiers sent to Jos faced, what threat to the nation have they warded off? “We are daily being killed by insurgents who have only one mission to disintegrate this nation and to wreak havoc on its citizenry. What have been our rewards? They also complained about the lack of modern weapons to fight the war. The presidential candidate of the Allied Congress Party of Nigeria, Mrs Oby Ezekwesili, while lamenting the death of the soldiers wondered why it took the military about a week to confirm the incident, even though its video had already gone viral. Ezekwesili, in a statement on Sunday, challenged military authorities and the Commander-in-Chief to prove that they had not failed the nation's soldiers. Ezekwesili said, “There are pertinent questions the Federal Government and the military need to answer. How did this latest in a series of killing of our soldiers in frontline of battle catch our country off-guard? Don't we think the official line that the Presidency and military have been pushing on the state of the terrorism war is endangering our soldiers and nation? Can the government be more honest on the challenges it appears to be facing in prosecuting the war? She advised the military to improve on its intelligence gathering, saying that would be key to defeating the Boko Haram insurgency. Meanwhile, the Minister of Defence, Mansur Dan-Ali, will be visiting Chad this week to hold a bilateral meeting with his Chadian counterpart, General Daoud Yaya. According to a statement by the minister's Public Relations Officer, Col Tukur Gusau, on Sunday, the visit would centre on the Multinational Joint Task Force troops drawn from Cameroun, Chad, Niger, Nigeria and Benin Republic. 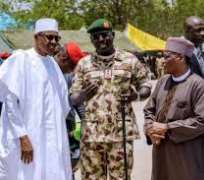 President Muhammadu Buhari had on Thursday reportedly given the directive to the defence minister to go to Chad to discuss the security lapses enabling the terrorists to attack the North-East of Nigeria. He said, “The minister is scheduled to visit Chad at a later date within the week to hold a bilateral meeting with his Chadian counterpart, General Daoud Yaya. The visit is in continuation of consultations on the Multi-national Joint Task Force troops.